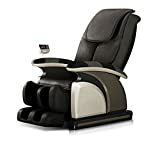 The ANANDA Massage Chair offers all the characteristics of a high-end massage chair at a very affordable price. It has a 2D system with 4 massage heads. The massage system can be applied to any point on our back as it covers a maximum length of 73cm and a width of up to 21cm. The ANANDA massage chair offers different types of massage. The main system with the massage heads offers up to 5 different methods: Shiatsu – Kneading – Flapping – Tapping – Simultaneous Kneading/Flapping Massage. They can be combined in 7 different automatic massage programmes and 3 manual massage programmes. In addition, it has a vibrating massage in the seat and a comprehensive air bag massage system (with 1 injector, 5 air valves and 23 air bags). All the features of the ANANDA Massage Chair will help you to obtain the following benefits: Fatigue recovery – Boosts blood circulation – Muscle relaxation – Reduces muscle tension – Soothes muscle pain – Relieves nerve pain. With the ANANDA Massage Chair, now you have no excuse not to enjoy a high-end massage chair at a very affordable price in your home!